QUALITY GAGING TIPS MMS JANUARY 2018 30 mmsonline.com Measurement Tools A Short Course in Surface Finish Measurement Surface texture, or finish, can be looked at from two points of view. For the machinist, texture is a result of the manufacturing process. By altering the process, the texture can be changed. From the designer's point of view, surface finish is a condition that affects the functionality of the part. By changing the surface finish specification, the part's functionality can be altered. Between the two is the viewpoint of the man- ufacturing engineer, who determines how the machinist is to produce the surface finish specified by the design engineer. The method chosen to measure surface finish depends on who needs to be satisfied. Texture consists of the peaks and valleys that make up a surface and their direction on the surface. Machining processes, such as turning, milling and grinding, impose these irregularities on a part's surface. Additional factors, such as cutting tool selection, machine tool condition, speeds, feeds, vibration and other environmen- tal influences, further influence these irregu- larities. Texture can be broken down into three components: • Roughness is essentially synonymous with tool marks. • Waviness is the result of small fluctuations in the distance between the cutting tool and the workpiece during machining. 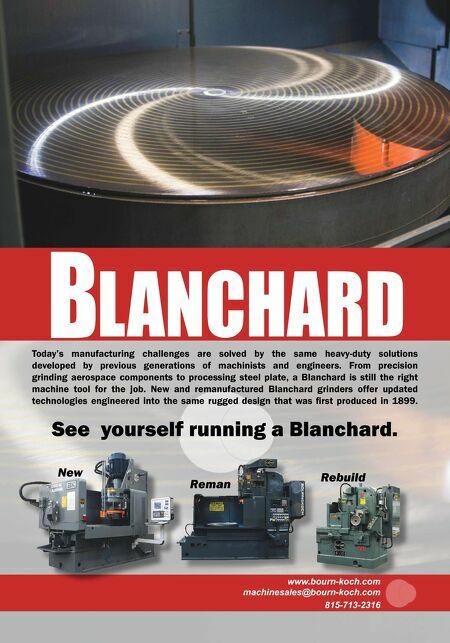 • Form (or rather bad form) is due to a lack of straightness or f latness in the machine tool's ways. All three components exist simultaneously, superimposed on one another. In many cases, it is desirable to examine each condition inde- pendently. Surface finish tends to be a stable condition and should not change from part to part unless process conditions change. Gages separate surface finish components using discrete units of length, called cutoffs. The length of the cutoff selected and used by various electrical filtering techniques permit the measurement of rough- ness by itself, waviness by itself or "total profile," which combines roughness, waviness and form. By examining roughness, waviness or total profile separately, manufacturing engineers can narrow the search for sources of error, and take effective action to reduce or eliminate them. Parameters are the quantitative methods used to describe and compare surface characteristics. These are defined by algorithms, which turn raw measurement data into numerical values. Although more than 100 parameters exist, machin- ists have traditionally relied upon just one or two. Currently, roughness average (Ra) is the parameter most widely specified and measured. The algorithm for Ra calculates the average height of the roughness peaks on the surface, within the sampling length, from a mean line. It serves as an effective means of monitoring process stability, which explains why it is the predominant param- eter in use today. Mean roughness depth (Rz) is widely preferred over Ra in Germany and else- where in Europe. Rz is based on the evaluation of five sampling lengths and averages the five largest peak-to-valley increments. 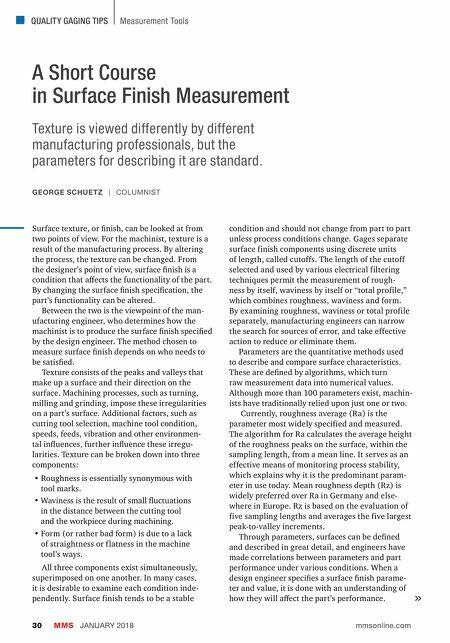 Through parameters, surfaces can be defined and described in great detail, and engineers have made correlations between parameters and part performance under various conditions. When a design engineer specifies a surface finish parame- ter and value, it is done with an understanding of how they will affect the part's performance. GEORGE SCHUETZ | COLUMNIST Texture is viewed differently by different manufacturing professionals, but the parameters for describing it are standard.